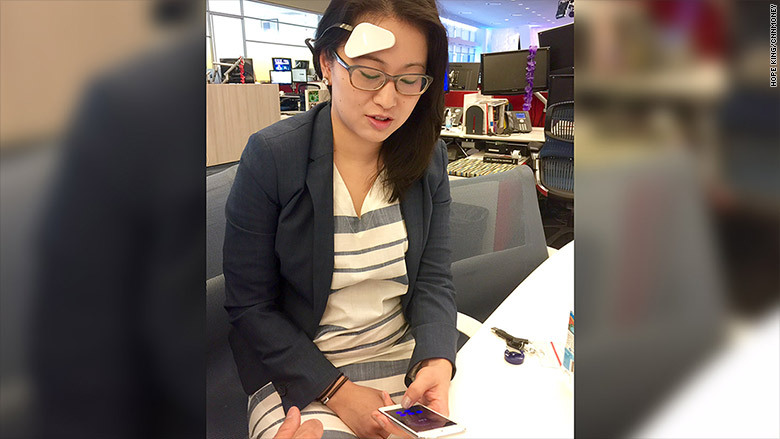 New gadget claims to zap you 'til you're zen: Does it work? You'll look slightly less ridiculous than a Google Glasser, and resemble something like a pirate with an out-of-place eye patch, or a head trauma patient. Thync, a wireless device that zaps your brain, promises to make you calmer or more energetic. 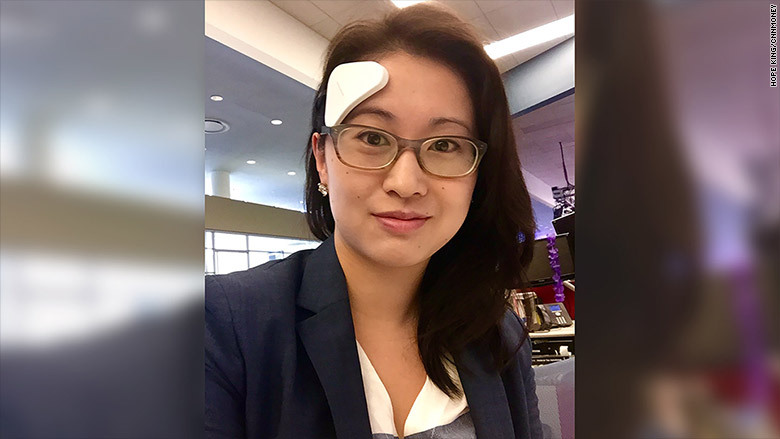 All you have to do is stick the gadget to your head and let it beam you with low-levels of electric current until you get there (typically about five minutes). Thync was developed by a team of neuroscience and biomedical engineering experts. They have tested the devices and software on thousands of people over the past three years. The company has raised more than $13 million from investors. The Thync team wants people to view their product as a new category of tech that can tap into our brains directly to change our moods. "You're using software to feel however you want," co-founder Isy Goldwasser told CNNMoney. "Products like ours can be a choice that people have in situations where there are drinks and pills...a great modern alternative." Scary as it sounds, I was eager to try it. Thync is actually a system of four products. The main component is a slightly curved, white, triangular device. It sits on your forehead above the tail of the right eyebrow. The package comes with two thin hydra gel-coated strips that snap into the main piece. The longer band wraps around the temple and attaches to the back of your neck, just below the hairline. The shorter one loops behind the ear, ending at the bone. It kind of looks like an eye patch. Thync instructs you to use the longer band if you want to create a sense of ease, and the shorter one if you need an energy boost. A dedicated app controls the setup, including the intensity and duration of the mood-altering pulsations, through Bluetooth. The set costs $299, plus $4 for every additional mood strip you might need. Pre-orders began shipping Monday. 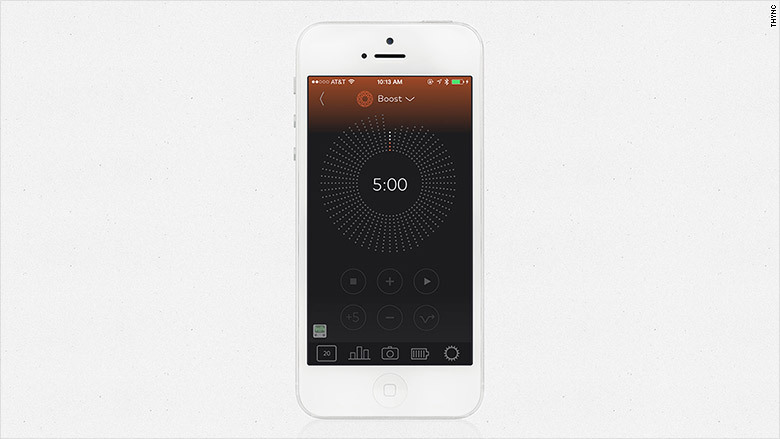 The app lets you adjust the intensity and duration of mood-altering pulses. Passing different levels of electric current through the nerves or the brain can affect their chemical activity. Thync is a modified version of this, and it doesn't claim to treat or cure diseases. Once you attach the modules to your head and turn on the app, thousands of tiny pulsations start tickling the nerves under your skin. These cranial nerves connect directly to the brain, according to Goldwasser. "Signaling" them can induce a variety of biological responses, including relaxation or alertness. According to the company, people shouldn't be concerned about the amount of electric current flowing through Thync. They say it's low-level -- generating only 20% of what over-the-counter muscle stimulation kits do, such as Icy Hot Smart Relief Tens. The app's software dictates undulating levels of electric flow to stimulate nerves in a specific pattern for each desired effect. Yes, but with one huge caveat: If you don't put it on correctly and begin the pulsations, it will hurt. And in my case, it hurt a lot. When he turned on the app, it felt like short pins and needles were shooting into my scalp -- rapidly. He thought it was a fluke so we tried again, in the same place. The sensation almost caused me to give up. What was I doing to myself? I let him attempt once more -- desperately hoping that the calm setting would actually kick in and erase the fear and anxiety I had developed. Luckily it did. Within a few minutes, I felt my speech slow and drop in volume. I felt serene and at ease for about an hour. Later in the day, I still felt tingles on the right side of my brain and head. Thync told me "the scalp sensations can last for up to an hour, but they should go away shortly." Maybe it was all psychosomatic, but the sensations did not subside until I went to bed. Now uploading: a sense of high. Thync could be an interesting chemical-free option for people who need help relaxing, or enjoy trying new ways to feel energized. But less intrepid souls (like me) may be scared off by the zapping.